Organizers for this league are Zarf & Idiot1995 if you have any questions just send us a message on xbox or via private message on this website. There may be people who host lobbies in certain divisions these people are race hosts and not the admins. In order to register for the Globe Cup, one seeding run must be completed. We will be running hopefully least two Divisions, (or more depending on numbers), so the run will determine your Division for the season. 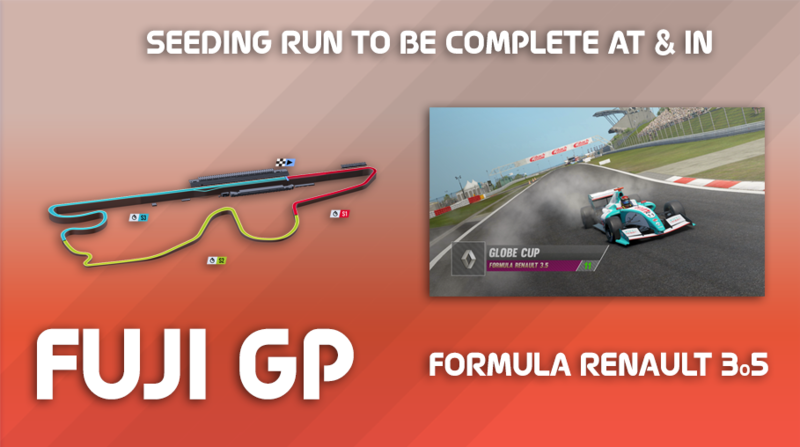 For your run, you must complete it in the time trial mode. Please note that the setups for this league are off so please complete the seeding run in one of the two default setups. Note the times do not set the divisions fully other things go into the organizing a division. We will be running a locked cockpit for Division 1 and abs off and traction control off so you may want to practice in this view and setting. After completing the seeding run, please take a screenshot/photo of your timing screen which shows the time trial mode. Then please post the photo/screenshot to this thread along with your name and Gamertag. Seeding runs will be taken up-to the 03/06/2018 where Idiot1995 & Zarf will pick which division you will be on and reveal it on the same day. Then the team registration will become available also the leagues are split after 12 people so that the game can handle the players. You can sign up then add a seeding run after. If you have any issues uploading an image please let me know or idiot1995 and we can help you. Make sure your in the correct car and track. Please use the format below to add your seeding run for the season and post your screenshots below it. You can have as many revisions to your times as you would like just update your original post and say "Updated Times"